The other day I spent the better part of a lost hour shoveling the snush outside. Snush, as we all know, is snow that looks like snow, but is sooo wet it's all slush underneath that fine top layer. It's a trap of nature and utterly disgusting. I hate slush and snush. I should have known the higher temp would just melt away everything (which it ultimately did) but for some reason (meteorology) I thought the temps might drop and then we'd have a heck-ton of ice on our hands and if there's one thing you don't want on your hands, it's a heck-ton of ice. As I'm sitting here, I can actually think of several things I don't want on my hands. Moving on. So I went out and back-breakingly shoveled the front steps and the sidewalk. We live on the corner so our designated sidewalk is vast. I actually love to shovel snow because as a lazy exerciser, this is perfect for me. Plus I'm all out in the elements and start to feel alive and things. Since it's a rule when you move to the suburbs, we bought a second car. The little black Honda (bless its little heart) is sitting in the garage this winter since we mostly use one car, the other one being a sturdier Pilot and can handle the harsh weather things. It sits on the driveway. For the longest time we had both cars on the driveway because we couldn't understand why anyone would want to fill a garage, aka EXTRA SPACE with cars! When there's plenty of free parking right outside the garage door on the driveway! I still feel this way but got scared for the little car, that it might not make it if we left it out. Anyway, the task was arduous. I sweated, I snotted. I hunched and worked at lifting from the knees, not the back. I tried other shoveling maneuvers since I don't really know the best way to shovel. For example, I started the "plow method" where you push the snow with the shovel and then sort of shove it to one side, never really picking it up. In fact, I just realized that's probably what a shovel is meant for. A shovel = tool that shoves. Anyway, it looks ridiculous and sometimes I try to slide on the icy snow while I do it and then get a shovel handle in the gut when the shovel catches on an uneven piece of sidewalk and I almost impale myself. It's a risky game. By this time I'm hurting. 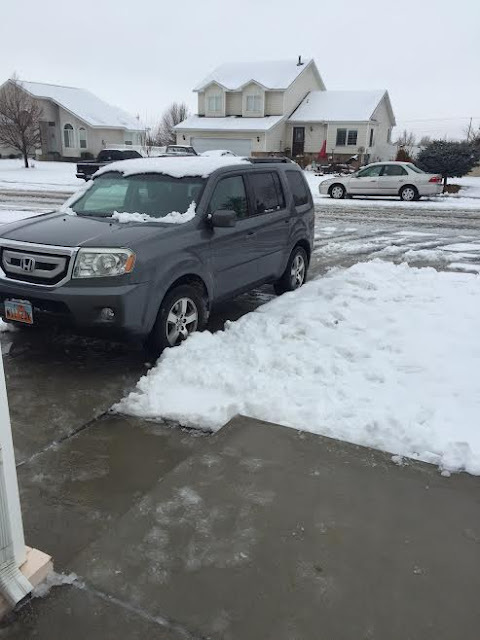 So for the driveway, I shoveled one side pretty well, then shoveled the other side pretty well so that when we parked directly over the snow strip in the center, passenger and driver alike will get clean cement when exiting or entering the vehicle. I finished up and went back inside. Sean would be home soon so I texted him and asked if he'd drive over (to mash down) a big snush puddle directly in front of the driveway which also would be a big fat time-waster as drivers would immediately splash a slush wall right back where it had been. Oh well. This whole winter/ snow caretaking housework is all theoretical for us anyway. It's just another example of us at "playing suburbs," like when we "do yardwork." As a game in the summer, I'd go out and "weed" for a bit. Everything is in quotes because it's not real, it will never be real. 1) why would we, in these cold snowy winter months, EVER prefer to take out the tiny civic to snow-drive with and leave the big car home? Why. Why. When. 2) Sean works from home. He often goes many days without driving. Me? I drive a bunch. I'm scraping the morning ice (happily, as it is a pittance compared to the old life). ME. Him? Never. 3) If the little car IS needed, that means one of us has the big car--taken away, far away leaving the driveway wide and clear. I was utterly baffled. And for a while, just couldn't let it go. "I just.. why? Why would you.. I mean, you want me to tramp through the snow to get in the car?? And the whooooole driveway is open. Let's make me walk through snow?? Or what, enter through the passenger side?? WHY? WHAT? HOW? WHAT." He laughed at my completely appropriate reaction and the grossness of his own foibles and with a bit of shame, vowed to go out and fix it. But I honestly thought that would be the meanest joke to play on someone. After all, it's the only scenario that setup would make ANY sense. I am tired of our heck-ton of ice. I gave up on shoveling when it snows because at least the snow provides a little traction on top of the ice. And our work parking lot could literally function as an ice rink.